Leaking amniotic fluid may be a sign that the mother is preparing to deliver. It can also be a sign of a condition that can pose risk to the growing baby. Amniotic fluid is the substance which surrounds the fetus as it grows in the uterus. The fetus may move about in this fluid, but it limits the wall of the uterus from contracting too tightly around the growing baby. The fluid also acts as a level of cushioning that protects the fetus from harm. This substance begins to form up to two weeks after fertilization. Amniotic fluid will take on different levels of proteins, carbohydrates, phospholipids, lipids and electrolytes as necessary to nourish the growing fetus. It can be difficult to determine if you are leaking. During the final trimester the fetus will put increasing amounts of pressure on the body, causing discharge to fall from the cervix. You may also begin to leak urine as the uterus puts additional pressure on the bladder. Unlike these substances, amniotic fluid is odorless and will soak the undergarments as it leaks in a significant amount. This leaking will continue endlessly once it begins to shed. You will have to change your undergarments regularly because of a steady discharge. Unlike urine, you cannot control the flow of amniotic fluid. The fluid is usually clear but you may find white specs and mucus in it. You should talk to your doctor immediately if you notice any brownish or greenish tint to the amniotic fluid. Some women are likely to experience cramping, but it is usually not that severe. Also, you may not be leaking amniotic fluid if it seems thick like mucous, has a urine-like odor, or has a yellow tinge like urine. It is a good idea to call your doctor if you are not certain about your situation. If you suspect you are leaking amniotic fluid, go talk to your doctor as soon as possible. They are in the best position to confirm if you are really having an amniotic leak. Spontaneous rupture of membranes or SROM is the most common cause. This is caused at the end of the pregnancy when membranes holding the amniotic fluid rupture, causing a leak. This is frequently referred to as a woman's "water breaking" and is a common sign that a woman is going into labor. If a woman is not yet at term, this rupturing of membranes is referred to as a premature rupture of membrane or PROM. These typically occur between 37-38 weeks of pregnancy. A tear in the amniotic sac will frequently cause this to occur. The leak will either appear as a slow trickle or a sudden gush of liquid depending on the severity of the tear. Immediate medical attention will be required to determine the cause of this tear. These can be caused by a defect in the shape of the uterus or the development of the amniotic sac, but a bacterial infection can also be the culprit for this condition. Other causes include an injury to the amniotic sac, pervious cervical surgery, and a history of amniotic sac rupturing. Some women may experience the issue due to dangerous lifestyle choices, such as taking recreational drug, smoking tobacco, or sticking to an unbalanced diet. If there is a major tear in an amniotic sac or it appears that this area has developed an infection it will require immediate medical attention. This stress increases the risk that the fetus will develop an infection. In many cases a very small tear will heal on its own, but large tears will require management therapy to avoid serious complications with the pregnancy. Doctors will first perform tests to determine if the liquid being observed is in fact amniotic fluid. Several over the counter tests are also available to help the mother test for this condition at home. If it is determined that the mother is leaking amniotic fluid, immediate management therapy will begin. If the fetus has come to term, the doctor will frequently initiate labor within 48 hours. This will help doctors determine if the baby will require any immediate medical attention to avoid an impending infection. Oligohydramnios is caused when there is not enough amniotic fluid surrounding the fetus. This can cause abnormal growth in the fetus, particularly stunting the growth of the lungs, a condition known as pulmonary hypoplasia. Oligohydramnios can also cause compression of the umbilical cord during birth as well as an aspiration of thick meconium that will make the baby's first bowel movement difficult. If it is determined that oligohydramnios is present, the amount of amniotic fluid present in the uterus will be carefully monitored. Several follow up visits with your doctor will be necessary to ensure proper monitoring of your condition. If the fluid drops below a safe level, an infusion of liquid will be given to help supplement the natural amount of fluid remaining in the uterus. If this is not sufficient, early delivery will be induced to help protect the fetus from potential harm. Hydramnios, also referred to as polyhydramios, is caused when there is an excessive amount of fluid surrounding the fetus. This can cause the mother to over-distend, leading to an early rupture of the amniotic membranes, also known as preterm labor, causing leaking amniotic fluid. This condition is frequently linked to defects in the baby. It can also cause an early detachment of the placenta from the uterine wall or a prolapse of the umbilical cord which may cause it to fall through the cervix and become compressed, leading to danger for the fetus. Factors that would influence treatments: The health of the mother and baby will be considered as well as her personal opinion when determining the best course of treatment for hydramnios. The condition will be monitored closely and the mother will be tested for her tolerance of certain therapies, medications or medical procedures. These will be weighed against the overall progression of the condition to ensure that the least amount of risk possible while treating the hydramnios. 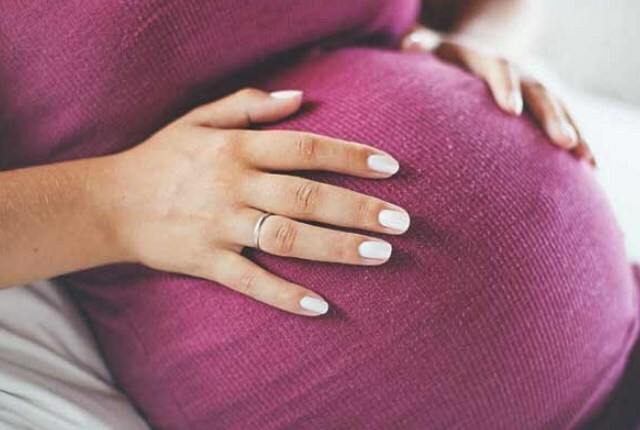 Treatments: If it is determined that the mother is suffering from hydramnios she will need to be closely monitored with several follow-up appointments to check the levels of amniotic fluid in the body. Drugs can be used to lessen the urine levels of the fetus to avoid adding additional fluid and pressure. In more severe cases an amnio reduction can be performed to take away some of the fluid in the uterus. This is performed by inserting a needle into the amniotic sac to draw away the liquid. If necessary the baby may be delivered early to reduce the risk of health risks to mother and child.